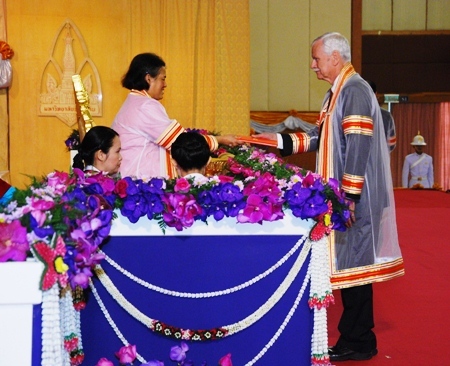 HRH Princess Maha Chakri Sirindhorn graciously confers an Honorary Doctorate degree in engineering to Professor Donald Carl Slack. On December 23, His Majesty the King graciously designated Her Royal Highness Princess Maha Chakri Sirindhorn to preside over the Graduation Ceremony at Khon Kaen University. There, the Princess royally conferred degrees to bachelor, masters and doctorate students who graduated from the KKU both last year and this year at the ceremony held at Kanchanapisek (Golden Jubilee) Convention Hall. There were totally 8,768 graduates for 119 doctorate degrees, 90 high certificates, 3,512 master degrees, 65 certificates, 4,983 bachelor degrees and 2 diplomas that received the degrees from the Princess. Meanwhile, KKU this year also presented honorary doctorate degrees in veterinary medicine to Her Majesty the Queen, Honorary doctorate degree in philosophy to Phra Thepworamunee, Honorary doctorate degree in education management to Professor Wang Xiaojia, Honorary Doctorate degree in engineering to Professor Donald Carl Slack, Golden Phrathart Panom Award to Phra Paisal Wisalo, Sri Mor Din Daeng Awards of honour to lecturer Assoc. Prof. Pisal Maireing and personnel Ms. Oonruen Mongkolchai, the most Outstanding alumni Awards to Wichien Sapcharoen and Chot Trachu, and Sri Kalaprapruek Award to student Ms. Rattana Kaewnoi. Mr. Yves Braibant (right) CEO and President of Big C Supercenter Public Company Limited presides over the corner stone laying ceremony of the new building of Fang Vocational School, Wat Thaton campus, at value of 6 million Baht which was raised by the Royal Krathin by Big C.　Along with Mr. Braibant are Mr. Somphong Khaikham (middle left), School Director of Fang Vocational School, Wat Thanton campus, and Phra Ratpaiyatmethi (middle right), Vice Governor of Buddhism Monks in Chiang Mai, the abbot of Wat Thaton. of the camp’s 15,000 children and their families. Well known Buddhist teacher, Master Ruma and a group of about 20 of his students traveled from Chiang Mai to Mae Sot to deliver 1,500 blankets to the residents of the Maela refugee camp and another 500 to the residents of NuPoe Refugee Camp, they also donated funds for the creation of a new Best Friend Library for the refugees. Chiang Mai Governor ML Panadda Diskul recently visited PTIS International School, where he met senior members of staff, addressed a school assembly and spoke informally with staff and students following the assembly. He was particularly full of praise for both the beauty of the campus and Mom Tri for realizing his original visions when designing the school. 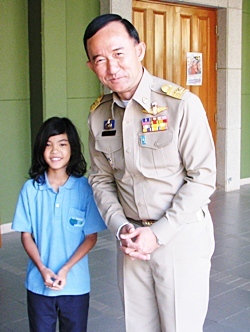 Governor ML Panadda chats with grade 6 PTIS student, First. Governor ML Panadda told students of his former postings as Governor of Nakhon Pathom Province, Deputy Governor of several other provinces and as international security advisor to the Ministry of Interior. He pointed out that Governors are appointed by His Majesty the King’s government in Bangkok – a tradition that dates back to the times of King Chulalongkorn, Rama V in the Chakri dynasty. ML Panadda himself is a descendant from King Rama IV, the Thai king made famous – or infamous – by the Hollywood film The King and I. The Governor told students that he had met several graduates from their “prestigious institution” and knew that those students were now studying at universities in Thailand and overseas. Although he has studied in the USA and Japan, he now finds himself with a new educational battle on his hands – learning to speak the Northern Thai dialect or pasan neua as he is keen to be able to communicate with all members of the local community. Following the assembly ML Panadda spoke to many students and was interested to see the national diversity present: in just a small handful of students he met children from Thailand, USA, Bhutan, Israel and Australia.